Please call for current pricing as prices are based on present market conditions and are subject to change without notice. All prices are wholesale and FOB our tree farm. All stock is guaranteed true to name and in good, healthy condition but we assume no responsibility after it leaves our tree farm. We guarantee that all products sold are true to description or variety name for which it is purchased, and that they are in good condition when shipped. It is mutually agreed that our liability for any error to description or variety name is limited to the purchase price. 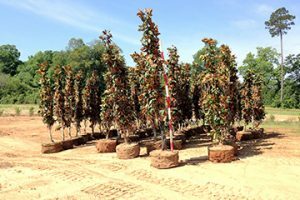 We give no warranty, expressed or implied, as to the life of or the productiveness of any nursery stock that we sell, and are not responsible for results obtained in transplanting. Any unsatisfactory stock must be reported immediately and held for advice from us as to its disposition. All claims must be made in writing within 48 hours of receipt of the products. In no case are we liable for any sum greater than the amount originally received for the product sold. 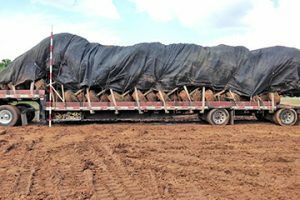 We use independent truckers who specialize in hauling nursery stock. Our carriers handle our shipments with great care to ensure a safe delivery. Our responsibility ends upon delivery to the carrier. 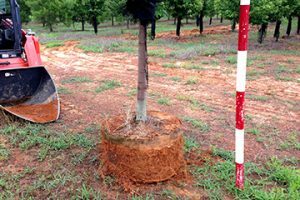 All trees travel at the risk of the purchaser. We can help arrange delivery options for those that have less stock (that will not fit on a trailer). Freight charges are payable at time of delivery. Buyer can arrange for pickup of product with 72 hours notice. Contact Eric Hall at 318-278-9763.